The Great and Secret Show is quite a long book. My copy contained almost 700 pages, but it’s a good book so the pages seem to fly by. The story unfolds over a matter of years—I am not sure how many, but I would estimate that at least 20 must pass between the first chapter and the last. The Great and Secret Show is split into seven parts. The first two parts run to 115 pages and set the background for a struggle that is still raging for the reminder of the book. It all starts with a man named Randolph Jaffe. Jaffe is a man whose life is going nowhere. There is nothing special about him he is just an ordinary Joe that takes a dead end job at the Post Office. Jaffe’s supervisor assigns him the most boring job imaginable and tells him to sort through the dead letters. Jaffe ends up sitting in a room by himself, going through all of the undelivered mail and salvaging any important stuff, like money, before sending it to the furnace. If Jaffe does find anything ‘important’ then he has to split it with his supervisor. It turns out to be an interesting job for Jaffe and one that changes his life. As he skims through all of the undelivered mail Jaffe begins to notice patterns emerging and finds hints of something hiding between the lines of the letters. Amongst all of the UFO sightings and the nonsense stories in the media, the zombie cults, the psychics and religions; Jaffe senses something bigger: a great and secret show. It is almost like a jigsaw puzzle. Some people have stumbled across a few of the pieces, but none of them realize that their piece is only part of a bigger picture. From his little room in the post office, amongst the piles and sacks of letters, Jaffe begins putting those pieces together and by the time he walks out of the post office, leaving his supervisor dead amongst the stacks of burning mail, Jaffe is close completing the puzzle. That is the start—a man with a mission. By the third part of the book many years have passed and Jaffe, who has attained a strange kind of enlightenment, is locked in battle with another enlightened being, Fletcher. Jaffe, now calling himself ‘The Jaffe’ is a negative and destructive force. Fletcher is a power of light. Even with their hands at each others throats they have managed to sire children by supernatural means. Those children are now grown and each of the parents expects their children to join with them in their fight. Only one problem: Two of the children have fallen in love. Something that neither The Jaffe nor Fletcher could have possibly foreseen. 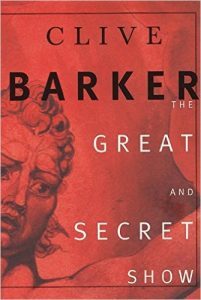 Within the pages of this novel Barker has created a whole new world filled with the kind of things that can only be dreamed up by a rich imagination, running on overdrive. The story could be classed as fantasy, but it also belongs in the horror genre. Then again, it is an adventure story with a quest and a little romance thrown into the mix, and so much more, all rolled into one unique and very entertaining read that Barker has called The Great and Secret Show.